ASEAN+3 Bond Market Guide provides an in-depth look at the region�s bond markets. It explains the markets� legal and regulatory frameworks, specific characteristics, trading and transactions (including settlement systems), and other relevant information and data. 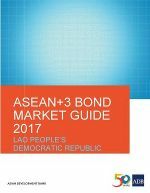 The Bond Market Guide 2017 for the Lao People�s Democratic Republic is the result of comments and contributions from ASEAN+3 Bond Market Forum members and experts, particularly in the Lao People�s Democratic Republic. A highlight of this guide is an update on the development of the country�s securities market.